When considering the economy of a country at a national scale, as a macroeconomic whole, economists investigate the way a country spends its overall income (GDP) in four components. These are Consumption spending by the households, Investment spending by the private sector, Government spending and the Net Exports (i.e., what is left once Imports are subtracted from Exports). In all countries (except perhaps in some tax havens), households are expected pay a certain amount of tax (as determined by laws) out of their various streams of income. After the taxes are collected, what remains is called disposable income. Households consume an important part of their disposable income (and this is the Consumption spending) and save the rest. Under idealized conditions and closed economies, savings are transformed into investment through the intermediation of the financial sector. Yet, in defining all these relations we need to emphasize one important point: In all the relations defined above, we abstracted from differences among households. Nevertheless, many low-income households, let alone saving, may be having difficult time making ends meet and end up getting into debt in order to even pay their monthly bills. On the other end of the spectrum, high-income households, compared to middle-income households, allocate a much larger portion of their income to savings. In Table 1, it is possible to track the ratio of national savings to the GDP together with the disaggregated private and public savings series from 1975 to 2010. After plateauing at around 25% between 1987 to 2002, private savings collapsed dramatically. A brief period of increase after 2006 is followed by a fall in 2008, the year of global crisis, and the savings rate fell below 15%. 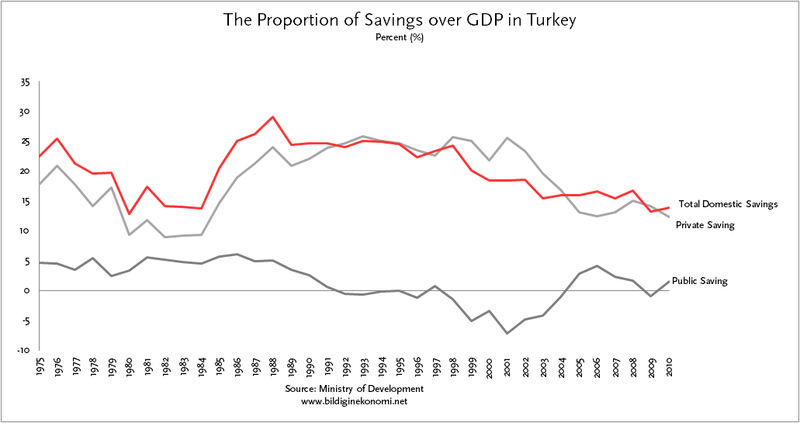 Studying the Table more closely, we can observe that between 2001 to 2008 national savings remained above 15% due to increased public savings. How this was possible is explained in some detailed in a separate entry, titled Budget Balance. 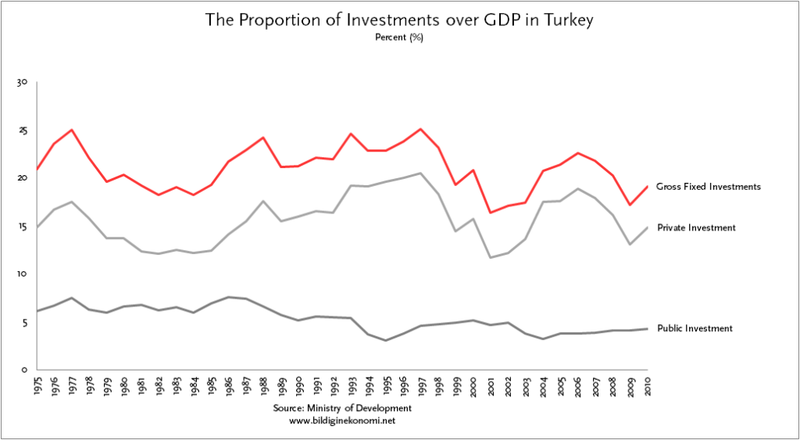 In Table 2, we observe how the ratio of Private Investment to the GDP grew steadily between 1985 to 1997, fell between 1998 to 2001, and resumed to grow between 2002 to 2006. Since 2006, the trend is downward. 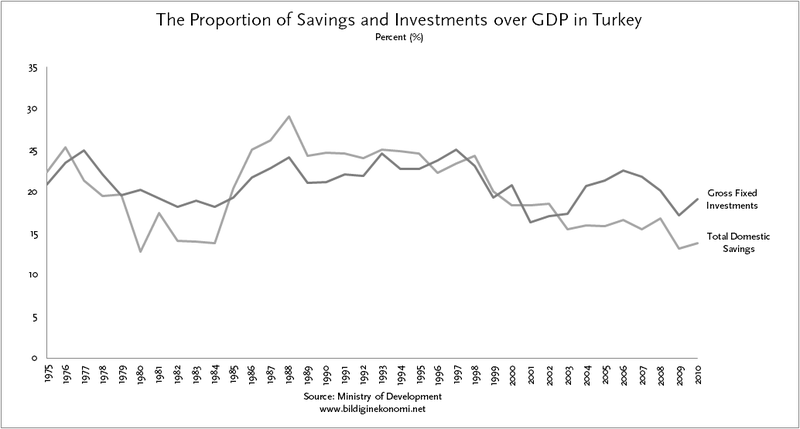 Private Investment, when compared to Public Investment as well as Savings, follows a much more volatile trend. This may be for a number of possible reasons. First of all, domestic savings is not the only source of funds for financing private investments. Private corporations may borrow funds from foreign savers. We have investigated this phenomenon and the potential fragility it entails in a separate blog entry on Balance of Current Account. In this occasion we should only add that for the private sector to be able to tap into international financial markets, the presence of a developed and internationally connected financial sector is required. Yet there is another explanation. As argued by John Maynard Keynes, investors and entrepreneurs can behave rather timidly and hesistatingly under conditions of increased uncertainity. This, in turn, makes private investment, compared to public investment, much more volatile. And finally, in Table 3, we can track the trajectories of national savings and gross fixed investment (as a proportion of GDP) together. What is most remarkable in this table is the divergence between investment and national savings that took place in 2000s. What made this possible, as noted above, is the fact that investors were able to access international financial markets to make up for the dwindling national savings. Dataset is downloaded from the Ministry of Development website, “Economic and Social Indicators” link.